“The Year-Long Programme gave me so much more than I had hoped for,” says Dana Clark. “It has helped me to understand all the changes I have been experiencing are a result of my practices. They are the unfolding of who I really am. I’ve learned to not be fearful when those changes are sometimes difficult. Describing her profound experiences as a Year-Long Programme student, Brenda Benna recalls, “Each time has been a revelation of the mysteries of things, not explained anywhere else, neither in my education nor in my Christian upbringing. I begin to get a taste of my true nature. It is the Self, I’m told. Regardless of what it is called, it sustains me through the good and the bad of life. It anchors me and supports my journey. When the programme is over, I begin to feel a sense of loss and can’t wait for the next program. The articles and recordings from Swamiji keep me in the flow. Enlightenment in the Midst of Life, Swamiji’s 2018 Year-Long Programme, begins soon. Click here to register for the Free Intro Call on February 28th. This entry was posted in Ashram News on February 27, 2018 by Svaroopa Vidya Ashram. “Just Don’t,” our February Teachings from Swami Nirmalananda and Rukmini Abbruzzi, inspires me to rededicate myself to practicing yoga’s yamas — uplifting lifestyle practices. I feel the richness of these five practices. They offer huge possibilities for me; for every human being. Some have been more up front in my life at different times. Some have evolved through different stages. What shall I return to first? Ahimsa, first on the list, means do no harm to others. I think of the many spiders I’ve encountered in my life. I’ve slipped a cup over them, slid a card underneath and carried it all out the door. It’s never really bothered me too much, except for one time when there was a very big spider, large and thick. It stopped me right in my tracks. For a moment I stood in the middle of the kitchen, before remembering to breathe. Finding my inner warrior, I mustered up the courage to help him or her get back outside. It felt good to have helped the spider. Of course, I continue to work on my aggressive impulses when they arise. My driving habits, however, still offer me something to work on. Sometimes I still speed, which could be harmful. Maybe after publicly disclosing this, I won’t anymore. Practicing satya requires that you speak only truth. I find speaking only truth so much easier. Have you noticed this? It is a practice, and it takes practice. Yet it is freeing as it simplifies life. The words flow out so much more easily, even when it’s challenging to tell a truth. It feels “right” in my gut. Asteya means don’t steal. The article reminded me that I caught myself stealing a while back. At the dentist’s tea table, I had just poured myself a cup of spice tea when I saw another choice — an organic, chocolate mint tea — a flavor I had not seen before. Oh, how delightful to try later, I thought. It is not my habit to take extra free goodies. Doing so on this occasion obviously bothered me on some level because I remembered the incident. Next time I go to the dentist, I will bring a teabag to leave there. It’s in my calendar. Currently, I’m enjoying the practice of aparigraha, no more greediness. With a shift in my financial situation, I am practicing much more earnestly restraining myself from “grasping for things I don’t need.” It feels wonderful, putting things in perspective, helping me to re-organize my life. Practicing yoga’s yamas, offers so much. They give you great ways to uplift yourself and keep your mind from pulling you out of Consciousness. In every moment there is choice. The yamas make this very clear. Practice the yamas. Just do. This entry was posted in Ashram News on February 20, 2018 by Svaroopa Vidya Ashram. Will Enlightenment Improve My Life? Yes, enlightenment will improve your life, but you’re going to get more than that. Enlightenment will improve the “you” that is living “your” life. In Kashmiri Shaivism, enlightenment is called “Self-Realization,” meaning it is about you being more you while you are in your life. In other words, your life is about you — not about who you know, where you go or what you do. Will I Have a Life After I Am Enlightened? Do I Have to Leave My Life to Get Enlightened? No. in fact, everything and everyone in your life is working on you. They’ll all be much happier when you’re enlightened. To get there, you do have to prioritize it, which means you cultivate a different perspective, even in the midst of the same things. As you deepen into your own inner center, your perspective gives you a new way to live as well as a new way to make choices. Even though there are hard parts along the way, life gets easer and easier. Of course, there are hard parts in life even when you’re not working on enlightenment, so you may as well go for the gold. Join my 2018 multi-media study programme, Enlightenment in the Midst of Life, which begins in March. Find out more in my FREE Intro Phone Call on February 28. This entry was posted in Ashram News on February 15, 2018 by Svaroopa Vidya Ashram. “It was really special — we even danced during the night,” says Rijumati (Ursula) Myslinski, recalling last year’s Ashram Shivaratri Retreat in Florida. Shivaratri is always celebrated in February at the dark of the moon. It happens tonight, February 13th. Let Rijumati’s experience, below, give you ideas for a Shivaratri celebration in your own home, even inviting other yogis to join you. This spiritual challenge is for the ultimate purpose of human life: to know your own Self. Remembering last year’s Shivaratri Retreat. Rijumati says, “Swami Nirmalananda’s sequencing of everything was superb. Our night included so much: meditation, chanting and sacred stories. We chanted with fervor. It built up slowly, as Swamiji is a master at leading this. Some meditations were short, and she told wonderful stories. The dancing was a surprise she was building up to! If you’re doing it at home, you can even dance if you want to. “A key ingredient in our ecstasy was the amount of time for our practices and the total focus on what we were doing. We had snacks to fortify us. Swamiji thought of everything. She warned us there would be two obstacles to making it through the night: the mind and the body. The mind was the stronger foe! Even with the ecstasy in the dancing, Rijumati was ultimately moved into a “state of peace and quiet”. She says, “It was an uplifting experience. Yogis aged 70 (and over) are cautioned not to stay awake all night. So I did have rest periods, including a two-hour nap. Yet I got up again at 3 am, and engaged fully in the ongoing festivities. With Swamiji’s guidance it was easy. The next day I felt pretty darn good. When I opened my eyes, I realized I could take the state of peace and calm with me, and started my day at the usual time. This Night of Shiva offers you the chance of a lifetime. You can become enlightened in this one night. Simply stay up all night for extended meditation practices and don’t fall asleep. It’s not too late to plan. In a cold climate, hunker down in your yoga cave; if your weather is warm, you may want to be outside. Plan for your all-night practices. Include recesses with healthy treats during the night. (If you’re 70 or over, plan naps, too.) Chant, meditate, read the ancient teaching stories about Shiva. Do poses, both to keep awake as well as to make your sitting for meditation better. Then meditate again. Repeat until sunup — or until as long as you have planned. Decide in advance and apply yourself. Rijumati recalls, “What was remarkable was a real bonding experience with the other yogis. It happened because of our shared ritual. One always gets closer to yogis in programs. This was a special night together.” Even if you are practicing solo, however, you will be in good company. In India and around the world, Ashrams and Temples will be open all night. This includes our Svaroopa® Vidya Ashram, with an all-night celebration at Downingtown Yoga & Meditation Center. This entry was posted in Ashram News on February 13, 2018 by Svaroopa Vidya Ashram. “I never thought I would hear that sound come out of your mouth,” exclaimed a regular participant at our yoga philosophy discussion group to another regular. It was a sound of ease and joy. Leola had realized that, though her life had not changed, her reaction to it was gone. Leola repeated the sound several times. Then several in our circle had fun repeating the sound. Group laughter bubbled up at Leola’s wonderful transformation. “Small-s self” melted away in that moment. Clearly coming from the Truth, Leola glowed. In September 2016, Leola phoned me to ask about yoga classes. I could hear deep stress in her voice. She was helping her daughters by taking care of grandkids daily, a one-year-old and a five-year-old. This was overwhelming, tiring work for Leola, with overactive young children. She had sleep apnea, tight muscles and aching knees. She wanted more flexibility and peace. She cried as I suggested in yoga class she would learn ways to care for herself. Finding time to come, however, was a roadblock. She said she would think about it and get back to me. A few days later she phoned to say “yes.” She registered for an upcoming session to claim an evening when she could get away. This first step set Leola on a life changing pattern of “doing more yoga.” Leola consistently attends yoga class and has committed to taking care of herself. She is consistent in every yoga practice she has taken up in the 18 months since beginning. This is even changing her reaction to life as she abides more and more in Self. Leola began with spinal release poses at home in the morning before starting her day. In class, she reported on her progress. After about five months, her early morning home practice included all the poses she’d learned in class. Her body — particularly her knees — and her mind were opening. Because she liked how yoga was helping her, she also joined my yoga philosophy discussion groups and satsangs. In these discussion groups, yogis bond deeply. In this safe community, they share the personal meaning they get from Swami Nirmalananda’s monthly contemplation articles. Leola learned principles of yoga philosophy, applied them in her life and connected with other yogis. Along the way, she often shared her yogic progress as well as her continuing, mostly frustrating, daily challenge with childcare. From attending the satsangs, she added meditation to her daily morning practice. In June 2017, Leola attended my three-class “Learn to Mediate” series. She went even deeper into “capital-S Self,” and understood even more about the “More” that Svaroopa® yoga provides. 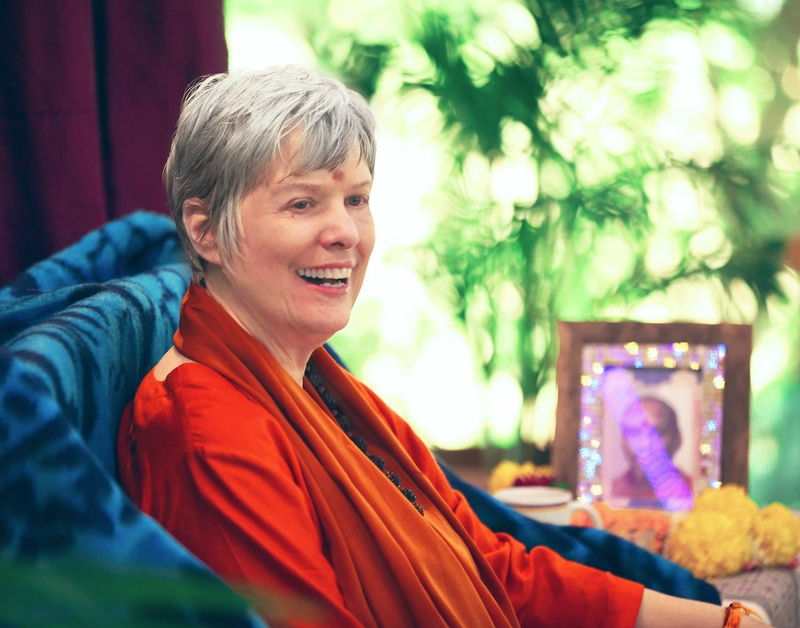 She understood that she was in the concentrated flow of Grace that comes from Swami Nirmalananda. Now knowing that Grace was supporting her, Leola added japa to her practices. When the time is right, she plans to add chanting before she meditates. Another Svaroopa® yoga teacher suggested Leola start Ujjayi Pranayama. Leola started waking earlier so she could do 20 minutes of Ujjayi Pranayama, as well as her meditation and poses before the kids would wake. She started noticing her days were getting easier with the kids. She has progressed to doing Ujjayi breathing for 20 minutes both morning and night. She prioritizes her weekly yoga class, going to another teacher when I am away or not teaching. Leola takes advantage of any “extras” that are available, so she is registered for our upcoming Weekend Workshop with an Ashram faculty member. Recently, Leola reported that her yearly medical visit to monitor the sleep apnea revealed positive changes. The amount of air needed from her machine reduced from 11 to 7. This was big news. She is heading toward getting off the machine. At our last satsang, Leola clearly blossomed forth in a big way. All group members gladly shared in her audible expression of ease and joy in her life. Even though the challenges of her family and babysitting have not changed, Leola is in joy when caring for her grandkids rather than being overwhelmed. The wonderful acknowledgement of Leola’s many positive changes from our group was heartwarming and fun! Clearly, Leola keeps expanding into Self through her yoga practices and into the flow of Grace day by day. It is a beautiful opening I am privileged to witness. I cherish the big smile on her face. This entry was posted in Ashram News on February 6, 2018 by Svaroopa Vidya Ashram.